Terra cotta planters are made from a natural clay material, and are reddish-brown in color. The color varies slightly depending on the clay used to make the plant container. Terracotta pots make an elegant home for tropical plants and flowers. They are available in a variety of sizes and styles to compliment interior décor and outdoor landscapes. Terra Cotta Containers – What Are The Advantages? Terracotta pots with thick walls will protect plant roots from extreme changes in temperature. Their earthy color and texture complements a variety of indoor décor and outdoor landscape or garden styles. Terra cotta planters are heavier than plastic containers, and less likely to be blown over by heavy winds. Concrete planters are available in larger sizes than other planters. 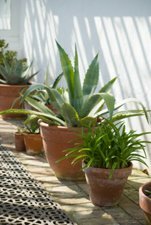 Terra cotta is porous, so over-watering plants is less of a concern than with other planters, however under-watering might be an issue. Terracotta plant containers are ideal for displaying a variety of tropical plants. Clay pots are susceptible to extreme temperature changes and chip easily. Decide what the planter will hold. Choose a planter that will accommodate the roots of the tropical plant when it reaches maturity, re-repot plant if necessary. Choose a high-quality, durable container that will be resistant to extreme temperature changes and less likely to chip or crack. Choose a color and/or texture that complements your landscape as well as the architectural style and design of your home. Clay planters are available in a variety of styles and designs. Caring for planters properly will keep plants healthy and ensure the container is structurally sound. Terracotta is porous and may require extra watering. Watering plants in freezing temperatures can cause containers to crack if the water freezes. Be sure to allow for adequate drainage or move the planter to a location (such as the garage) that will protect the planter from freezing temperatures.